Sonic Hedgehog Protein (SHH) is a protein within the Hedgehog family of growth factors. This monomer is encoded for by the shh gene and has a final translated product of approximately 462 amino acids and a molecular mass of 45 kDa. The SHH protein is a key component in the regulation of organogenesis, especially the growth of digits on limbs and the organization of the brain, within mammals. SHH performs its role in development as a morphogen. SHH protein is utilized as a morphogen by diffusing to form a concentration gradient around a cell. This concentration gradient subsequently induces different effects in the surrounding cells based on the concentration of this gradient. Additionally, SHH remains important throughout mammalian lifecycles due to its role in cell division, particularly of stem cells. This role in cell division has also led to the implication of a role of SHH in some cancers. SHH expression within an embryo is dictated by the presence of a related morphogen called fibroblast growth factors. This leads to the original 45 kDa SHH precursor protein to be subsequently cleaved into its active state. The cleavage of the original SHH protein results in the production of two separate products a 25 kDa C-terminal fragment (HhC) and a 20 kDa N-terminal fragment (HhN). The HhC is an active component of precursor processing while the HhN product is used to continue SHH signal propagation. HhN forms the concentration gradient around the cell. This concentration gradient the interaction with transmembrane proteins HHIP and PTCH1 of neighboring cells. The interface between HhN and the transmembrane proteins results in either the obstruction or spread of the SHH signal. The Sonic Hedgehog protein consists of one polymer, 462 amino acids in length with a molecular weight of 45 kDa. In an embryo, SHH production is initially stimulated by the secretion of fibroblast growth factors (FGF) in limb bud precursor regions. When SHH is originally secreted there is a small signal sequence in the N-terminal region. This sequence is recognized by a signal signal recognition particle during the translocation into the endoplasmic reticulum (ER). After translocation the signal sequence (amino acids 1-23) is removed in the ER using a signal peptidase. This removal serves to initiate the activation of the SHH protein. Activation results in the autocatalytic cleavage of the SHH preproprotein into two individual sections. These two separate regions, a 25 kDa segment C-terminal fragment (HhC) and a 20 kDa N-terminal fragment fragment (HhN) perform different roles in the SHH pathway. A protease within HhC serves to autocatalytically cleave the precursor (SHH). During this process, a cholesterol is attached to the C-terminal glycine of HhC through an ester linkage. This allows HhC to act as a cholesterol transferase and covalently attaches a cholesterol molecule to the carboxy terminus end of HhN. This activates HhN allowing it to have an active role in SHH signal propagation. The activeHhN monomer contains 169 amino acids, which allows HhN to form a symmetric structure of 3 helicies and 8 Beta sheets. During normal physiological conditions, HhN captures two different metal ions, Zinc (Zn2+) and Calcium (Ca2+), within neighboring active sites. These ions are located in two different sites of the HhN fragment, the Zinc ion in the pseudo-active site (non-catalytic active site) while the Calcium ion is located an adjacent binding site. These ions are essential for proper protein folding that occurs when SHH interacts with both HHIP and PTCH since the absence of these ions has been shown to impair binding. Hedgehog interacting protein (HHIP), is a 700 amino acid long dimer protein involved in the hedgehog signal pathway. HHIP plays a role in the SHH pathway through protein-protein interactions between HHIP and the HhN-cholesterol complex of SHH. 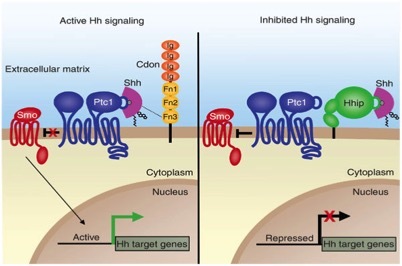 HHIP binding to HhN inhibits the binding of PTCH1 to SHH resulting in the repression of the downstream propagation of the SHH signal.The binding between HhN and HHIP occurs through three different loop contacts on HHIP (L1, L2 and L3) to loops on SHH (L1, L2 and L3). The relative interface between the two proteins is relatively large as it comprises 23 amino acids from HHIP and 29 amino acids from HhN over a surface area of between 870 Å2 and 780 Å2. Binding of HHIP and HhN occurs around the pseudo-active site of HhN. During the binding process, the L2 loop of HHIP inserts deeply into the pseudo-active site groove (between loops L1 and L2 of HhN). This allows HHIP L2 to interact with five histidine residues (His 133, 134, 140, 180, and 182). These residues form hydrogen bonds with the L2 loop of HHIP, helping to lock it into place within the groove (not shown in pdb). Additionally, HHIP L2 binding of HhN occurs near a Calcium ion active site. This proximity to the Ca2+ active site helps to stabilize the interactions of L2 with the pseudo-active site groove. The HHIP L2 loop does not directly contact the calcium ion, but the attraction of Ca2+ further increases the affinity of HHIP for HhN. The interaction of the L2 loop with HhN helps to support the the primary interaction between HhN and HHIP. This interaction is centered around the Zinc ion located within the pseudo-active site groove.This Zinc2+ ion is held within the pseudo active sites by residues Asp147,His140 and His182 of HhN. Then when HHIP interacts with HhN, Asp383 from HHIP binds to Zinc2+ anchor HHIP to HhN. The interactions of the proteins with the Zinc ion results in a stable tetrahedral conformation of the amino acids around the ion. SHH binding of patched homolog protein (PTCH) regulates downstream signaling due to the interactions between PTCH and Smoothened (SMO). PTCH is a 1447 amino acid long transmembrane protein that acts as a positive repressor of the SHH signal through the regulation of SMO. This occurs when PTCH is bound to SMO as it is able to regulate SMO oxysterol accumulation. However, SHH binding to PTCH detaches PTCH from SMO thus hindering its ability to regulate SMO oxysterol accumulation. This allows SMO to accumulate oxysterols facilitating the delocalization of SMO thus propagating the SHH signal. The same binding site used by HHIP (the pseudo-active site of HhN) is used when PTCH binds to HhN. This suggests that competitive binding occurs between HHIP and PTCH for the binding site. Like HhN binding to HHIP, the interaction between HhN and PTCH is centered around a zinc ion. Like HHIP, Asp383 anchors PTCH to the zinc ion in the pseudo-active site. This again creates the stable tetrahedral conformation of amino acids around the Zinc ion. Also, interactions similar to the HHIP L2 loop interactions with HhN occur in PTCH binding of HhN. The sequence of HHIP L2 shares a great amount of sequence similarity to the second ectodomain of PTCH. The second ectodomain corresponds to the PTCH loop 2-like loop (PL2). This explains the similarity in the binding of between the binding of PTCH and HhN and the binding of HHIP and HhN. This binding similarity is shown through interactions of the PL2 and HhN. As was the case with HhN binding to HHIP L2, the PL2 binds HhN within the groove of the pseudo-active site. Here the two external loops of HhN that surround the active site bind with PL2 through Hydrogen bonding of the five histidine residues (His 133,134, 140, 180, and 182). However, unlike HHIP, PTCH does not appear to interact with the Calcium ion active site adjacent to the pseudo-active site. Instead, it appears that hydrophobic interactions of residues along PL2 replace the stabilizing effect observed with the attraction of HHIP L2 to the Calcium ion. Vincent, John B., Abdul Noor, Melissa Carter, and Ayeshah Chaudhry. "Research." PTCHd1-base. Camh MIND: Molecular Neuropsychiatry and Development Lab, 22 July 2014. Web. 07 Dec. 2015. Bosanac, Ivan, Henry R. Maun, Suzie J. Scales, Xiaohui Wen, Andreas Lingel, J. Fernando Bazan, Frederic J De Sauvage, Sarah G. Hymowitz, and Robert A. Lazarus. "The Structure of SHH in Complex with HHIP Reveals a Recognition Role for the Shh Pseudo Active Site in Signaling." Nat Struct Mol Biol Nature Structural & Molecular Biology 16.7 (2009): 691-97. Beachy, P.A., Hymowitz, S.G., Lazarus, R.A., Leahy, D.J., and Siebold, C. (2010). Interactions between Hedgehog proteins and their binding partners come into view. Genes and development 24, 2001-2012. Varjosalo, M., and Taipale, J. (2008). Hedgehog: functions and mechanisms. Genes and development 22, 2454-2472. Rebollido-Rios, R., Bandari, S., Wilms, C., Jakuschev, S., Vortkamp, A., Grobe, K., and Hoffmann, D. (2014). Signaling domain of Sonic Hedgehog as cannibalistic calcium-regulated zinc-peptidase. PLoS Comput Biol 10, e1003707.